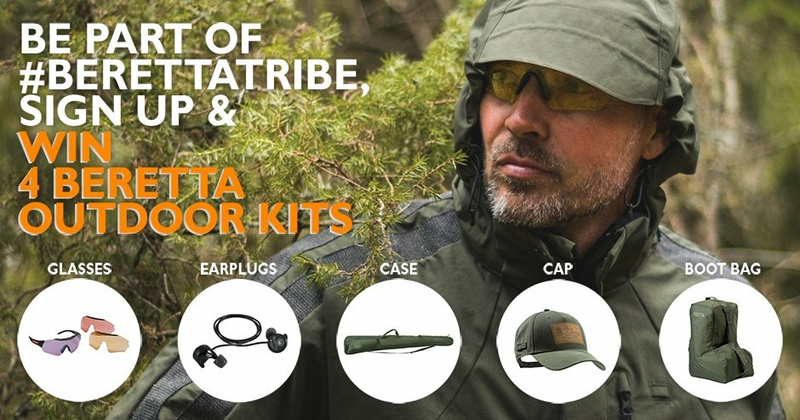 BERETTA CONTEST: FILL THE FORM TO WIN 4 AWESOME OUTDOOR KITS. Discover the best way to start the hunting season. FOR YOUR CHANCE TO WIN 1 OF 4 AWESOME BERETTA OUTDOOR KITS. Valid from 9th July to 10th October 2018, with final draw to take place by 31st October 2018. To participate, sign up for the newsletter and confirm participation in the promotion. one pair of glasses, one case, one bag and one cap. Retail prize value of each kit: €1.064,00. 1 x Puull protective eyeglasses. Specifically engineered for superior eye protection. 1 x ST-R Active earplugs. 1 x B-Wild 140cm Case. protection against scratches and water..
1 x Beretta B-Wild Boots Bag. A functional case featured by back opening and shoulder strap.